An enzyme in the bacterium that causes potato scab could help create new, environmentally-benign biocatalysts with the potential to cut use of the highly corrosive chemical nitric acid. Chemists at the University of Warwick in the UK, in collaboration with researchers at Cornell University in the USA, have reported in the journal Nature Chemical Biology the discovery of an enzyme in the bacterium Streptomyces scabies that catalyses an aromatic nitration reaction. TxtE, a cytochrome P450 enzyme, is the first example of an enzyme that has specifically evolved to catalyse an aromatic nitration reaction. It does this by using the gases nitrogen monoxide, generated from the amino acid arginine by the nitric oxide synthase partner enzyme txtD, and dioxygen. These results may eventually find application in industrial chemistry, where the highly corrosive chemicals nitric acid and sulphuric acid are currently used to carry out aromatic nitration reactions. Engineering of the TxtE enzyme may allow it to be developed as a nitration biocatalyst for the production of industrial chemicals without the need to use nitric acid. 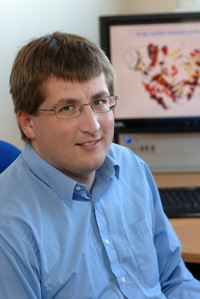 Professor Greg Challis of the Department of Chemistry at the University of Warwick, who led the project, said: “Nitration reactions are very important commercially, for example to make explosives and nitroaromatic compounds that are key building blocks for industrial chemistry. “Such reactions are currently performed using highly corrosive chemicals like nitric acid, which is difficult to handle and is environmentally unfriendly. Cytochrome P450 enzymes are ubiquitous in living organisms. Usually they are responsible for hydroxylation and other oxidative reactions – but this is the first time that they have been reported to catalyse a nitration reaction. TxtE catalyses the introduction of a nitro group into a specific position of the aromatic ring of the amino acid tryptophan. This is the first key step in the biosynthesis of thaxtomin A.
Thaxtomin A enables Streptomyces scabies to damage potatoes and other root vegetables by inhibiting cellulose production, thereby damaging the cell wall and allowing an infection to take hold. The enzyme’s crucial role in thaxtomin A biosynthesis makes it a potential target for the development of new molecules to block thaxtomin production and thus prevent potato scab, a disease which places a significant economic burden on the agricultural industry globally. The paper Cytochrome P450–catalyzed L-tryptophan nitration in thaxtomin phytotoxin biosynthesiswas published in the journal Nature Chemical Biology. The paper Cytochrome P450–catalyzed L-tryptophan nitration in thaxtomin phytotoxin biosynthesis was published in the journal Nature Chemical Biology.